ABB Connect: 3 Reasons you should download and try the app today. Short disclaimer – I’m Andrew Wheeler, responsible for the digital marketing communication for the Electrification Products division at ABB, and part of the team shaping the future direction of ABB Connect. Views are my own. You can learn more about ABB Connect at ABB.com. If you’re a new comer to Electrification Products, as I am, or you’ve known of its vast array of products and solutions for years, but still find it daunting, then ABB Connect will be a companion you’ll want every time. It’s easy to use, accessible globally and will answer your questions on everything from home automation to EV charging, across a wealth of different industries, whether you’re a customer, a distributor or a salesman. ABB Connect was first introduced in 2015, and with a dedicated project team has gone from strength to strength. 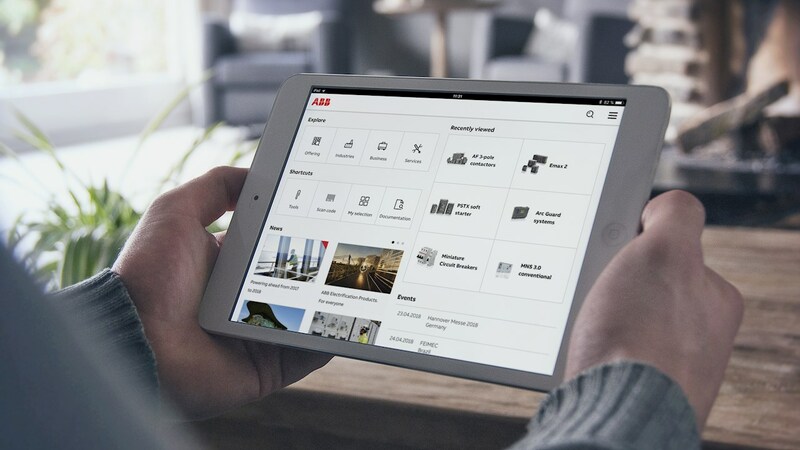 In its current form, ABB Connect offers ours sales teams, distributors and customers instant access to the entire EP portfolio, with more ABB offerings coming with each new release, enabling users to stay updated with the latest news in a single interface. If you haven’t already installed ABB Connect, or on the fence considering whether to try it – here are my top 3 reasons for using it, from personal experience (with no cheesy sales pitch) gained over the last 5 months. 1. ABB Connect is great on tablets and smartphones. Sounds obvious, I know. But too many apps are simply website clones, packaged in a responsive app wrapper and adding little value to their end users. ABB Connect doesn’t fall into that camp – having been designed from the ground up to accommodate mobile and tablets, it gives a rich user experience. The UI is slick and responsive, whilst remaining true to the ABB brand. 2. ABB Connect is fast. Really fast. If you want near instant access to the EP portfolio and related offering, look no further than ABB Connect. No more bookmarks and saved brochure links – simply open up the app on your tablet and you’ll breeze through it in no time. It’s also an active portal to dive into the latest news and events – without having to leave the app environment and move between different sections of ABB.com. Another bugbear of mine are ‘one shot’ apps, often neglected and left to gather dust in the app store with no further updates. But with a dedicated team to stamp out bugs and deploy new features, ABB Connect is getting better all the time! The ABB Connect you install today has been shaped by user’s feedback, and it’ll continue to evolve to better serve our customers with each new release. In summary, the above are just 3 areas which stood out to me from using ABB Connect, there are many more which support our digital first approach to doing business and serving the needs of our users. ABB Connect is available for free for iOS, Android and Windows 10 users. For more information on the app, please refer to the official page.